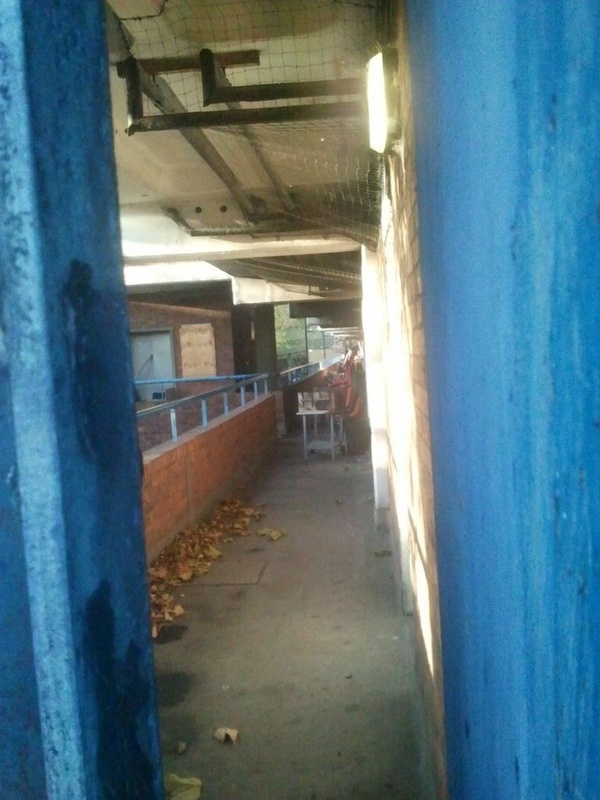 I passed over Heygate on the Thameslink last week, for the first time since B. and I trespassed the fences last winter, days after the estate’s one remaining tenant was evicted. 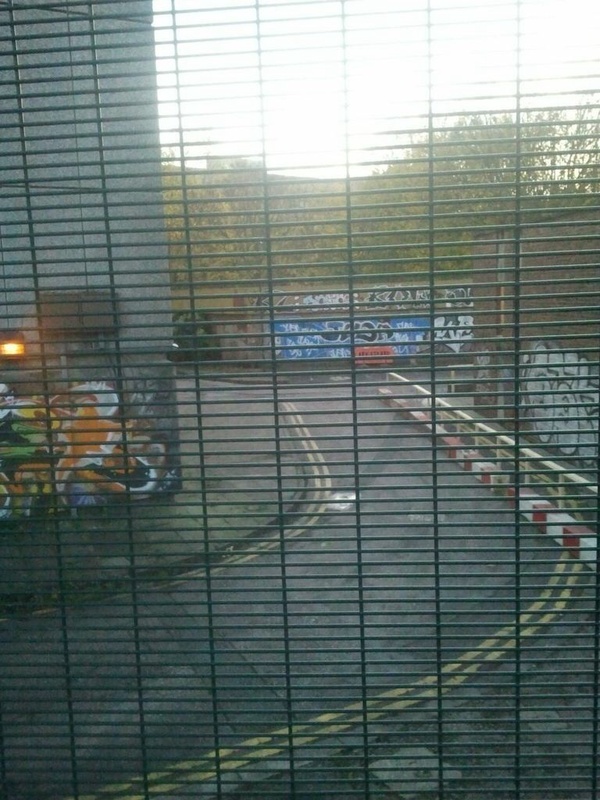 From the elevated rails at Elephant and Castle I could see over the ten-foot barriers. All but two of the blocks were gone, in their place a shock of brown, a field newly opened to the sky for the first time in how many years (centuries)? Ploughed earth: you don’t see that often in London. Or ever. Seen from above it had texture, design. It suggested a concept, an intention, hinted at a provocation. It looked like a massive piece of contemporary art. That day last winter, we hadn’t met since Occupy. 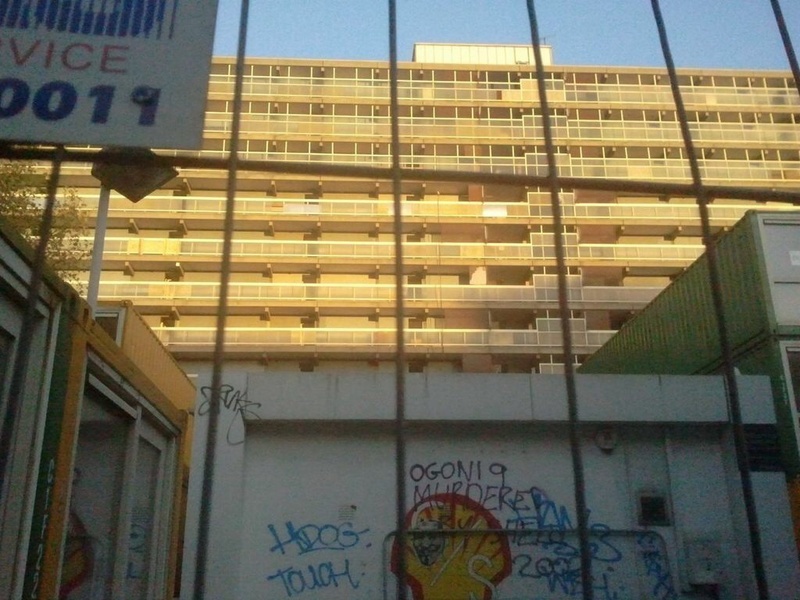 B. had spent the intervening years occupied by the campaign against Southwark Council’s sale of Heygate to Australian company, Lend Lease, who plan to build 2,500 new apartments on the site of the estate’s original 1,200 social housing units. Three-quarters, B. told me, will sell at full market value, with only 79 let to ‘secure tenants’ at ‘social rents’. In 2004 the council had promised 50% ‘affordable housing’1 (a local pressure group now calls for a guaranteed 35%2 ). 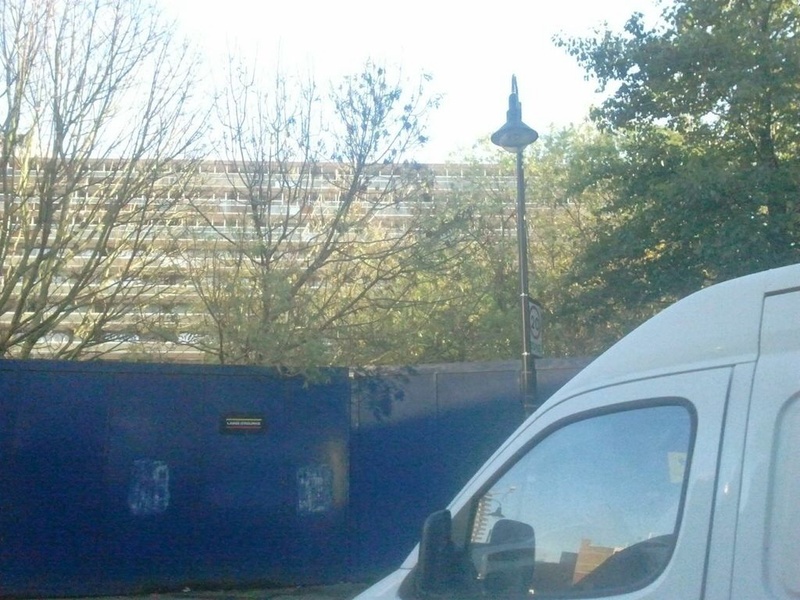 The remaining 500 or so flats will sell for 80% of the market-dictated price, a scheme the developers call ‘affordable’ though, with a one-bed going for £380,0003 , it is unlikely many of Heygate’s former residents will be able to buy. “Everyone will have the opportunity to move back to the Elephant and Castle area under ‘right to return,’” Southwark Council’s website still insists. “Residents are given seven years to return to the Elephant and Castle area if new housing is available for them,” though “as the new housing has not yet been completed in accordance with this new deadline, residents will need to move twice.” The present completion date for the scheme is 20294 . Meantime, the population of Heygate was – in an odd, gentrification-appropriate euphemism – “decanted” across London and South-East England5. I first met B. in October 2011 at Occupy London. Though deeply involved, B. didn’t fit the Occupy stereotype. Older, quieter, neater, B looked nothing like an activist. 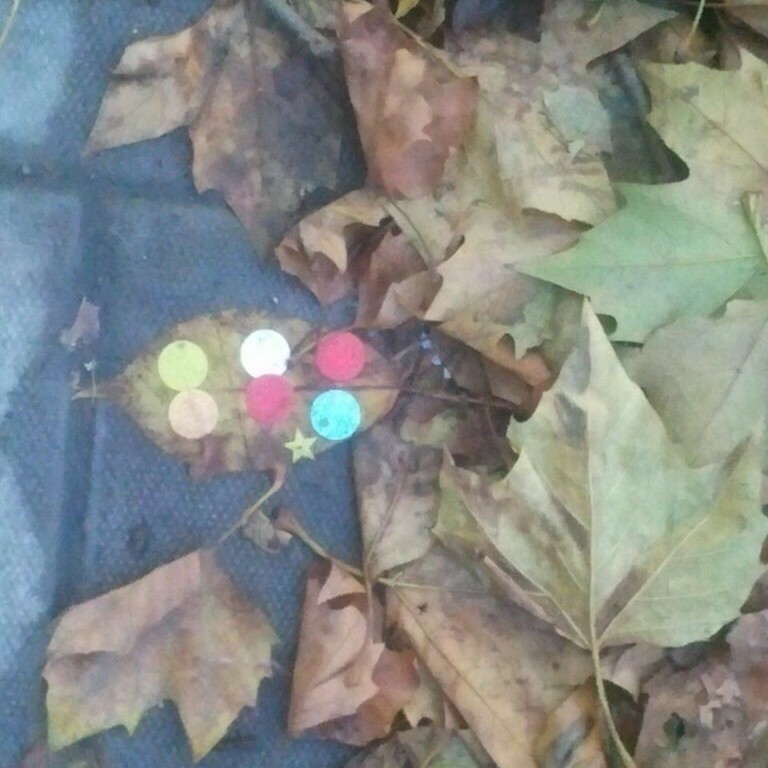 That autumn London was beautiful, warmer than usual. The Occupy camp at Saint Paul’s resembled the arts festivals I’d been to that summer. There was bunting, and posters with cute hand lettering. The tents were bright, the signs were jokey, the parody of the Starbucks logo as squeaky clean-cut as the Starbucks logo itself. Into October, into November, it looked like winter would never come. I was there to teach drawing, and I was nervous, unsure I had any right to Occupy. Politics and art are different: a protest isn’t about what it looks like, right? Americans were occupying for all the right reasons: friends of friends were losing their homes, holding benefits to pay for healthcare. That wasn’t happening in the UK, not yet. Involved, rather than committed, on one visit I was caught up in a student demo against fee restructuring. I was kettled, chased by police with riot shields and truncheons. The night before there’d been press rumours of rubber bullets: maybe they had guns. The protest was smaller than expected, the protesters non-violent. I wasn’t even sure I supported it. About that time, I saw Youtube clips of Occupy Cal: at Berkley, black and white tents floating mid-air, tied to white and black helium balloons. For a moment, art was life, or life was art, or that’s how it appeared. At the classes I taught at Tent City University, I asked people to work small-scale, recording, in words and pictures, what they saw, what they heard, what they did. I tried to tell them each story was important – the more stories, the better – that an archive was as much a monument as a statue or a plaque put up after the event, that the amateur, the immediate, was as interesting as the accomplished, the distanced. Why leave it to the professionals? I taught them a few tricks so they wouldn’t be afraid of putting pen to paper. I gave out notebooks and pencils. In the new year the Saint Paul’s camp was cleared, and early in 2012 I was at the shortlived Occupy School of Ideas in the arty heart of Hoxton, where I remember spending an afternoon listening to a man explain his very own brand of feminism while his supportive wife, loaded with bags of his self-published brick, handed out leaflets to an audience of several. There was an exhibition in the garden of the School, the paintings, mostly graffiti-influenced, losing almost everything in the transfer to canvas. The Occupy Cal tents looked like conceptual art: smart, slick and professional. They looked like they did something. 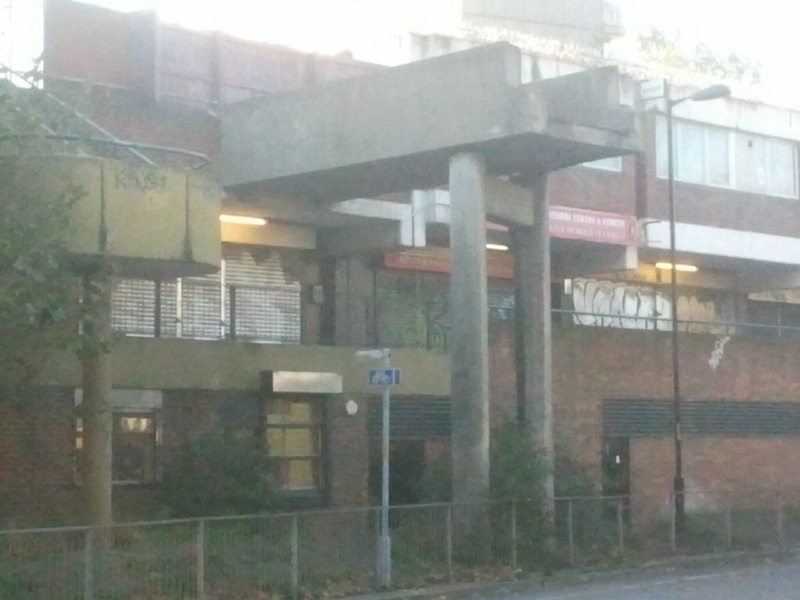 B. first came to Heygate in 2010 with a group of Visual Cultures students on a project about Utopias. 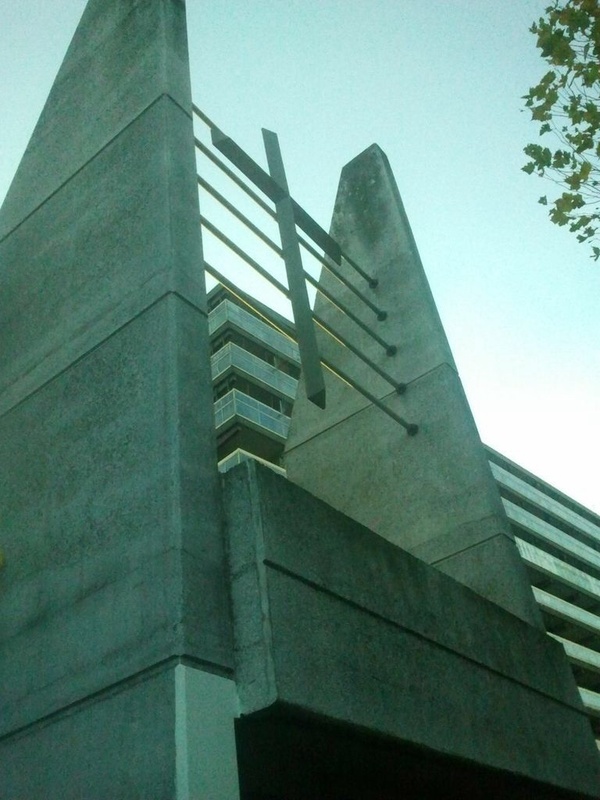 What one Southwark councillor called a ‘concrete fortress’6 wasn’t unknown as an art destination and had already been used as a set for fashion shoots and dystopian movies. B.’s group had a kind of standoff with students from the Royal College of Art who, already in situ, were digging over the neglected communal gardens: theory meets praxis. “What are you ‘doing’?” the Cultures students asked. 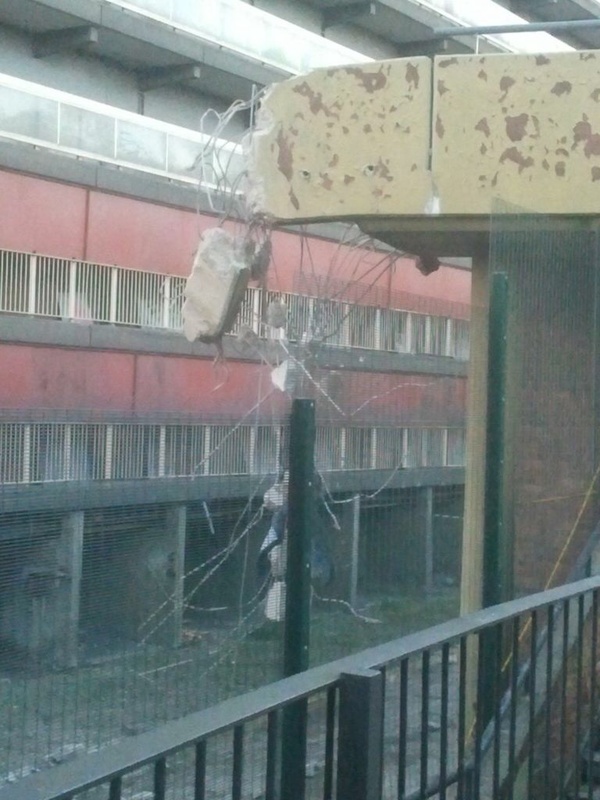 Southwark Council turfed out the students but opened its own resident’s garden across the way in 2012. When we visited we could still see plastic crates planted with late sunflowers and cabbages going to seed behind the padlocked gates and chicken wire fences. (“The residents’ beds,” said B., “were sown in drawers recycled from discarded furniture.”). 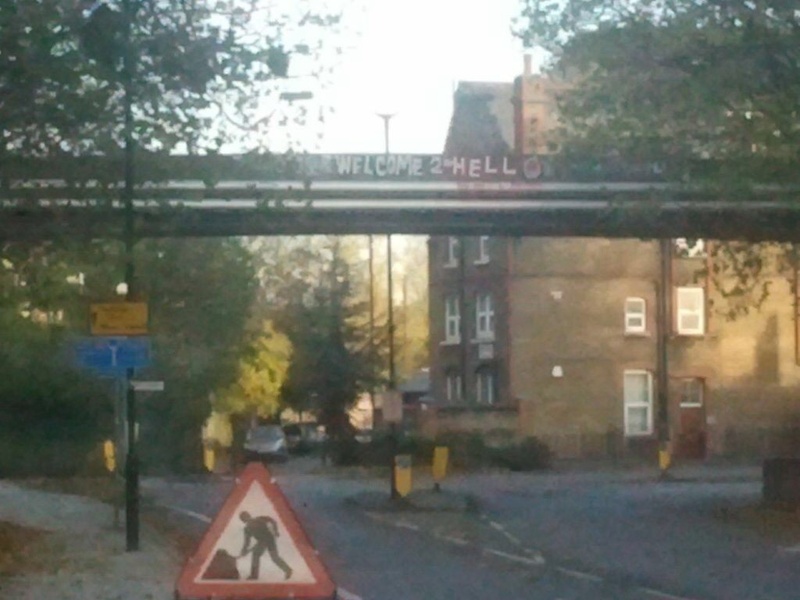 A council notice read: GUERILLA GARDENING, though it wasn’t. In the middle of a vegetable patch, a geodome… We talked about Drop City where the geodome was invented in the 1960s, and which imploded in a mess of ideological and personality clashes. 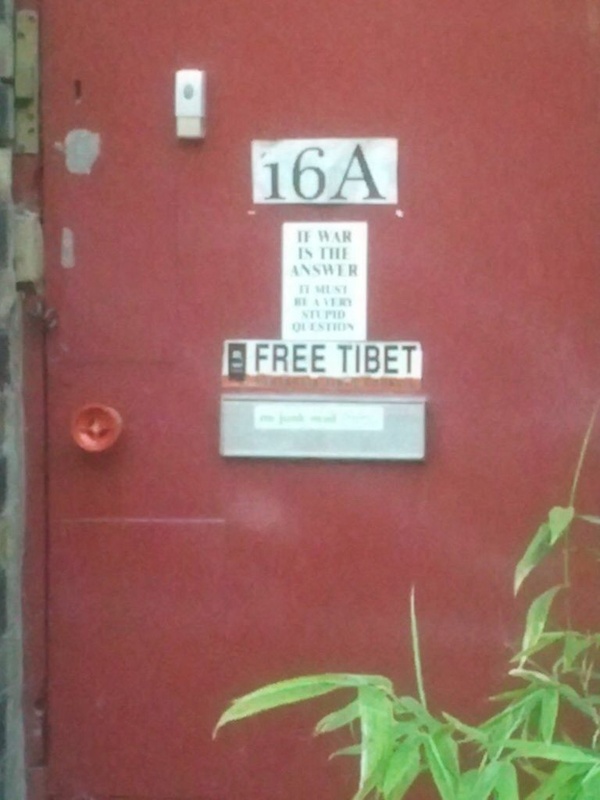 “That happened at Occupy London,” said B., opening up – if warily – about the camp’s difficulties, not an easy thing to do: B. had already been denounced as an agent provocateur by friends and, once, by a lover, for cracking the movement’s public facade. 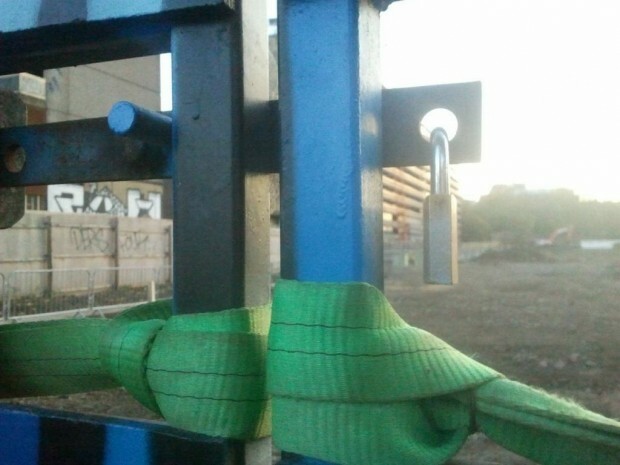 As the protestors at Heygate were already in residence, they had no need to occupy, and the campaign had taken place quietly, supported by petitions, blogging, journalism. 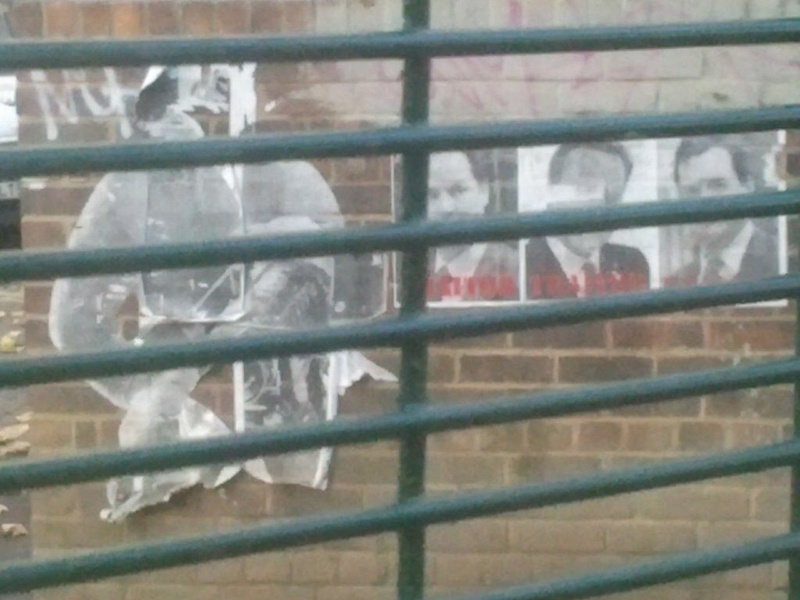 The biggest evidence left behind was art: the paintings, stencils and posters that dotted the estate. 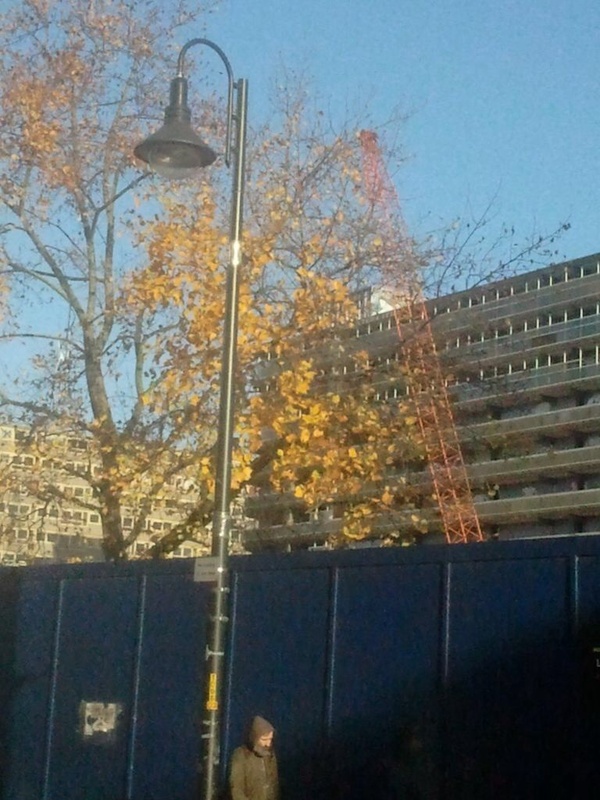 Built in 1974, Heygate once housed 3000 residents in rent-controlled, council-owned apartments. Despite the introduction of ‘right-to-buy’ and private housing associations by the Conservative government of the 1980s, keen to wind down this area of investment, around 17% of UK households – in London, around 30% – are still socially housed. Prices in the capital mean the pressure on councils to sell, rather than maintain the buildings on lucrative sites, is high. At the same time they struggle to retain ‘key workers’ – teachers, nurses, local authority employees – whose wages don’t cover market rents. 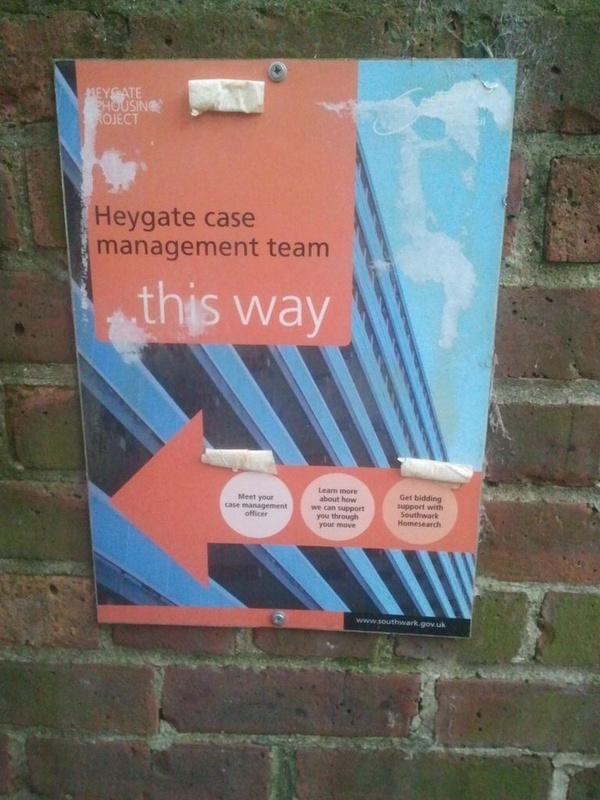 It’s no accident Heygate’s last resident, protester Adrian Glasspool, is a teacher. The week before we visited he’d been forcibly bought-out at a price that meant he could afford to live nowhere nearby. On the buildings’ lower balconies we saw ivy-choked abandoned bikes and garden ornaments that had belonged to residents dispersed to London’s suburbs. The gardens were more beautiful overgrown. 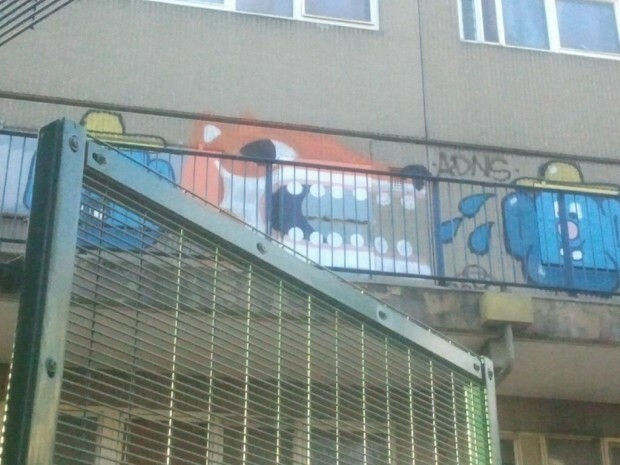 What is it with artists and ruins? They’re cheap, and – usually – vacant, plus they’re a shorthand to the radical glamour of Arte Povera, of Gordon Matta-Clark’s downtown New York ‘building cuts’ of the 1970s. B. and I were looking for Mike Nelson’s installation in progress. 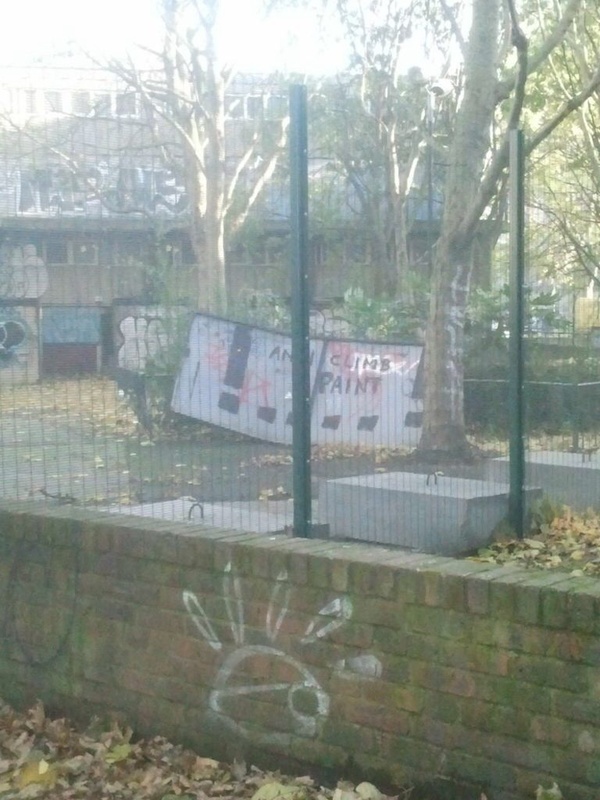 The artist had just begun, with Southwark’s permission, to remove walls from some of the flats to create a ‘pyramid’ that would take their place until demolished to make way for the newbuild. Paul Bennun of Nelson’s sponsor, Artangel, a privately-funded agency that also receives Arts Council grants, and has a history of projects using abandoned buildings, including Rachel Whiteread’s House, was friendly, said we’re welcome, though artists can be sensitive about showing work in progress. He’d try to get in touch with Mike. We didn’t hear back. Around the site there were men in neon orange vests and hard hats, and men in neon yellow vests with walkie talkies. They might have been builders, though there was no deconstruction going on, so some of them might have been artists, though others might have been security. I asked two of them if they were with Artangel. They said no, but that the art was in the yellow containers round the other side of the estate. 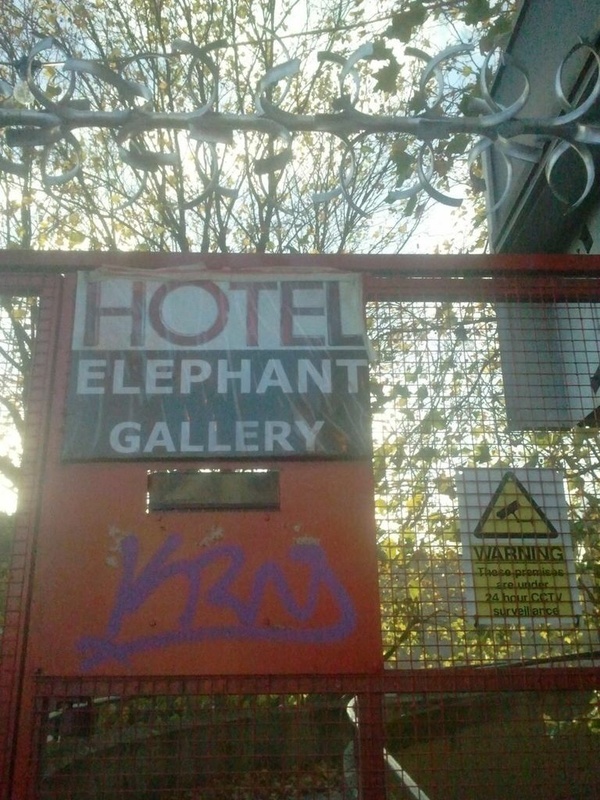 We walked round past Hotel Elephant, where art students from outside Heygate had been given permission to run a gallery, the week after Southwark closed down a resident-run temporary cinema showing films made by locals. Hotel Elephant claimed no Council involvement but did admit funding from ArtCore, a private/government-sponsored project. “Was it popular?” I asked B. Then we both turned our cameras. Below a chalkboard for the gallery’s pop-up restaurant – “LAMB SHANKS, HAND-PICKED something” – a squirrel posed with a nut. 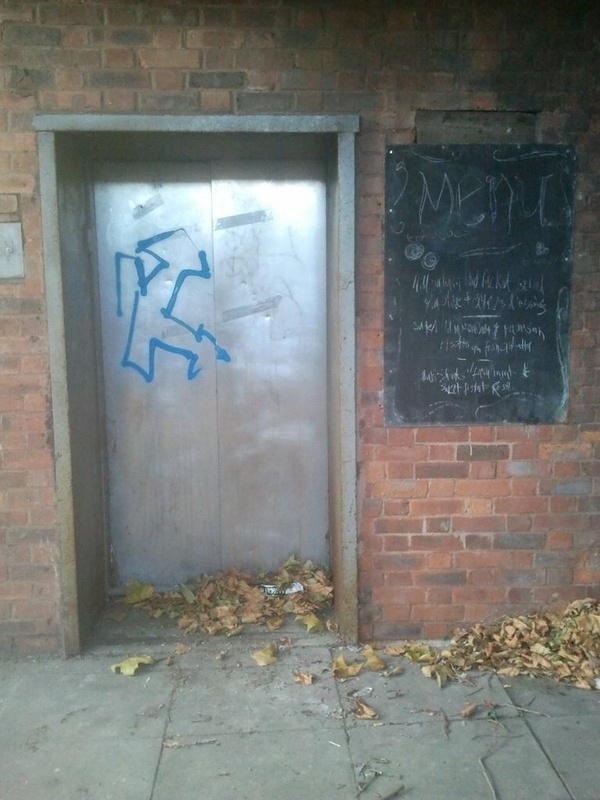 When the estate was fully occupied, B. told me, there was little graffiti. That came later as the blocks were shut up, shut down. On a visit to the site, in August 2013, B. came away streaked with anti-climb paint. Back round on the Walworth Road, we found the yellow and green shipping containers were not Artangel’s, but belonged to theartworks.co.uk (later I typed the url and get ‘page not found’. I tried again this week: same thing), and were designed to be used as pop-up cafes, artists’ and artisans’ studios. 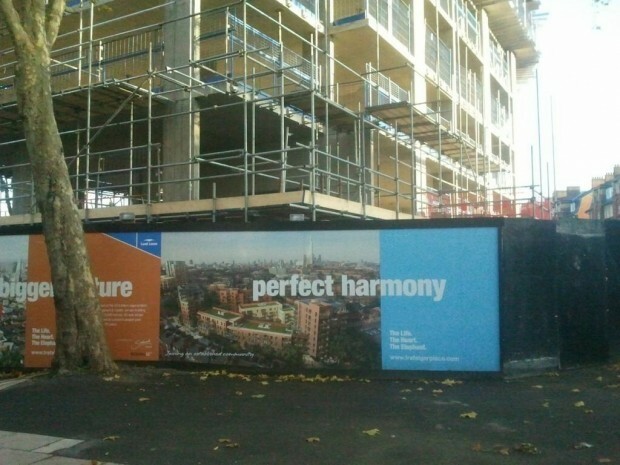 I googled and found a resident’s protest group that called the plan REGENERATION SEEKS AMNESIA7 – the use of artists as conduits for developers, confirming Heygate’s intermediate status as a ruin. By that time it was cold. So cold I couldn’t press the buttons on my camera/phone. We gave up on finding the installation, and found the Electric Elephant cafe, a few streets from Heygate. It was warm: all primary colours and paper lanterns, tie-dye throws, retro oilcloth, and pamphlets for sale titled HEART OF THE ELEPHANT and RIGHTS OF COMMON. The food was good and, for London, not expensive. The cafe was also part of an ‘estate’: Pullens Buildings, one of London’s last Victorian tenements once considered an eyesore, and threatened with redevelopment in the 1970s, now protected as a conservation area. Round the corner from the buildings was the “seriously hip” (The Times) Iliffe Yard, a mews street, once a Victorian light industrial estate. Workshops that once housed, “industrial clog makers for the Fire Service; stationers; makers of ships’ fans; manufacturers of X-ray machinery; hat makers; brush makers,”8 are now home to “designers, wood workers, printmakers, jewellers and artists,” and everything there looked good, but was mostly expensive, and outside of the everyday. In 2011, about the same time I got involved in Occupy, Chris Kraus applied, unsuccessfully, for Guggenheim funding, proposing “the lease/purchase and operation of the now-vacant Kelly Lake General Store in this hamlet outside of Hibbing, Minnesota…10 The business of Kelly Lake Store,” wrote Kraus, “will the be the store: selling groceries, gas, cigarettes, and other convenience store items. The store will not be used as a venue for art exhibitions or performances. Instead interns and staff may choose to keep and/or create documentation of the store’s work – photographs, drawings, text, journals… Kelly Lake store will address both a present-day need (in Kelly Lake, for a store) and a paradigm shift in the definition of artistic practice.” Such “Post-Art” writes Kraus, quoting critic Jerry Saltz, “embeds imagination in material.” It doesn’t look like ‘art’ and, growing from place, is more difficult to appropriate commercially. It Occupies. I felt bad, I told B. that winter, about losing the thread of activism after Saint Paul’s to concentrate on my own work. “Don’t!” says B., who’s considering throwing in a PhD at the college responsible for producing half of the YBAs for a course at a less “glittering” institution. B. talks about glitter a lot: the ‘glitterati’ of the left, as responsible as the right, B. says, and more culpable, for the appropriation of the Occupy aesthetic stripped of its political ethos. “But what can artists do to get involved,” I asked? “They’re fucked,” said B., who had already shrugged on a coat, and left. 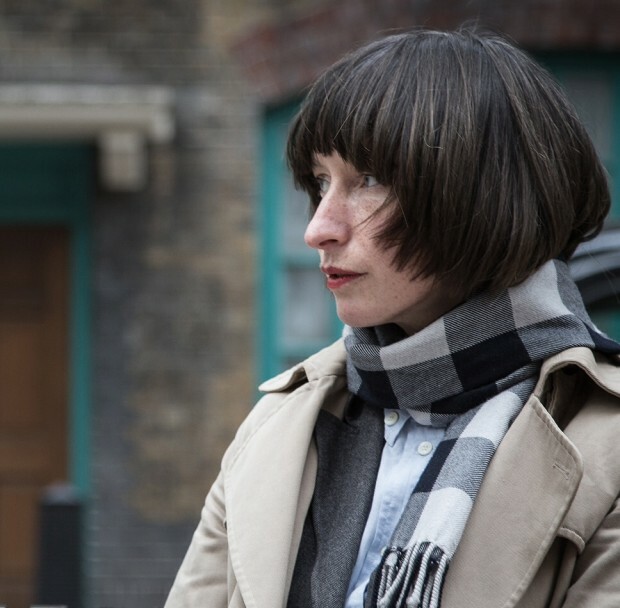 Joanna Walsh’s work has been published by Tate, The White Review, The Guardian, The London Review of Books (online) and others. Fractals (short stories) is published by 3:AM Press. She has forthcoming work in Salt’s Best British Short Stories 2014, and Dalkey’s Best European Fiction 2015, and is currently working on Hotel (Bloomsbury, 2015). Her story, ‘Vagues,’ is in issue one of gorse.